This listing is for a custom portrait piece to be painted in this style. 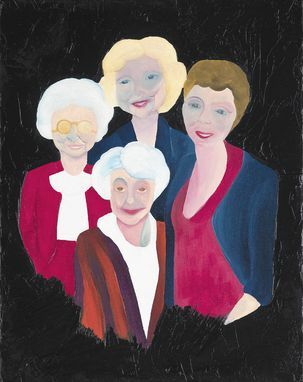 I can paint celebrities (such as the Golden Girls pictured here) or your loved ones if provided a photograph. This particular piece is oil on canvas and measures 11 x 14 x 1.5 inches. For custom work, I can paint in any size and can use any color palette. You may provide a photograph for me to paint from or I will find a photograph of your desired subject matter at no additional charge. Custom work takes 6 weeks to make and ship.